Hybrid racing cars aren't the only vehicles grabbing all the press snaps at this year's Detroit Auto Show. Volkswagen's Golf blue-e-motion, is breathing eco-friendly and energy-efficient technology from a small body that definitely boasts an appeal that speaks to the everyday automotive consumer. As the electric version of Europe's most popular selling car, the VW Golf, this petrol-free iteration features an electric motor mounted under the front bonnet producing 85 kW/115 PS and a maximum torque of 270 Nm, a continuous power output of 50 kW/69 PS, a top speed of 84mph, and 0 to 60/mph will clock in at 11.8 seconds. Moreover, the lithium-ion battery provides 26.5 kilowatt-hours, giving way to a driving range of 93 miles, and growing - the company estimates by the time the model makes it to production, the car's range rating will be even higher. Set for release by 2014, VW will equip the Golf blue-e-motion with an instrument panel, featuring a kW gauge replacing the traditional tachometer, that will engage the driver in keeping the kilowatt reading as low as possible and maximize the range of the vehicle. The car will also boast selectable regenerative braking – meaning there will be four levels, from “sailing” to heavy-duty regeneration that can be managed with shifter paddles on the steering wheel. With the lowest setting D allowing the car to “sail” normally once the driver’s foot comes off the accelerator, while the highest level, D3, slows the vehicle down and recovers as much energy as possible. The Golf blue-e-motion will also offer three different driving options, including Normal, Comfort+ and Range+. If you’re not looking for fancy bells and whistles, the VW’s Golf blue-e-motion could be the affordable, alternative energy vehicle you’ve been looking for. Come 2014, of course. 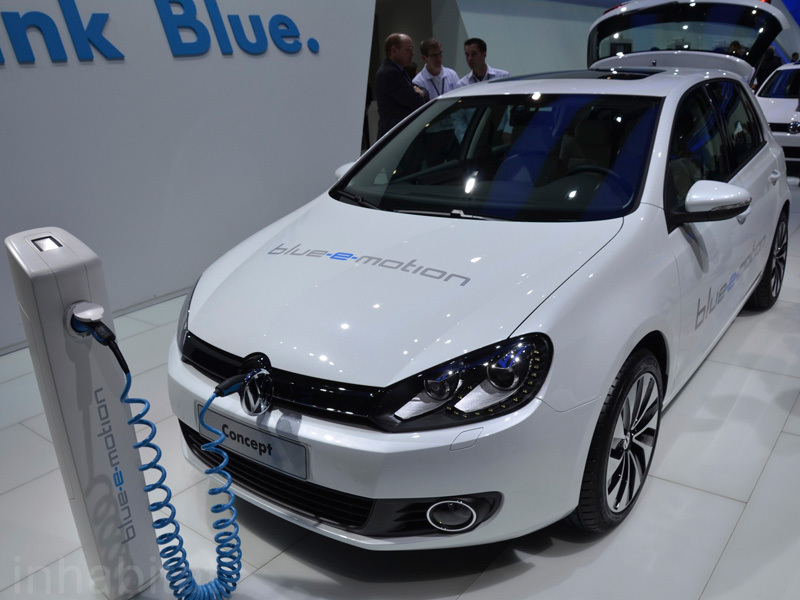 Set for release by 2014, VW will equip the Golf blue-e-motion with an instrument panel, featuring a kW gauge replacing the traditional tachometer, that will engage the driver in keeping the kilowatt reading as low as possible and maximize the range of the vehicle. The car will also boast selectable regenerative braking - meaning there will be four levels, from "sailing" to heavy-duty regeneration that can be managed with shifter paddles on the steering wheel. With the lowest setting D allowing the car to "sail" normally once the driver's foot comes off the accelerator, while the highest level, D3, slows the vehicle down and recovers as much energy as possible. The Golf blue-e-motion will also offer three different driving options, including Normal, Comfort+ and Range+. If you're not looking for fancy bells and whistles, the VW's Golf blue-e-motion could be the affordable, alternative energy vehicle you've been looking for. Come 2014, of course. The back of the Volkswagon blue-e-motion. The blue-e-motion's headlights seen from up close. A look inside the roomy trunk. 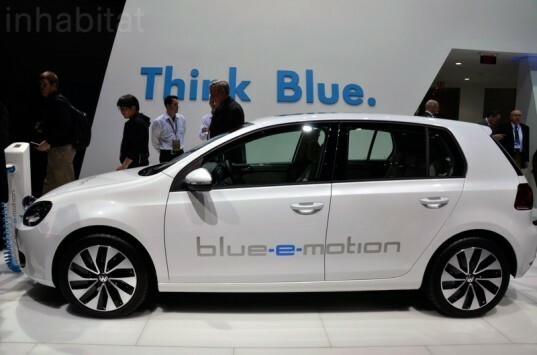 The blue-e-motion still has all of the sporty looks of the Golf, but with a much greener footprint. A look inside the blue-e-motion's cabin. The blue-e-motion's rather stylish tires. Set for release by 2014, VW will equip the Golf blue-e-motion with an instrument panel, featuring a kW gauge replacing the traditional tachometer, that will engage the driver in keeping the kilowatt reading as low as possible and maximize the range of the vehicle. The car will also boast selectable regenerative braking - meaning there will be four levels, from "sailing" to heavy-duty regeneration that can be managed with shifter paddles on the steering wheel. With the lowest setting D allowing the car to "sail" normally once the driver's foot comes off the accelerator, while the highest level, D3, slows the vehicle down and recovers as much energy as possible. The Golf blue-e-motion will also offer three different driving options, including Normal, Comfort+ and Range+.